Thanks to Pauline Stanhope (nee Young) for this photo taken around 1955 showing Durham Wharf from the canal. 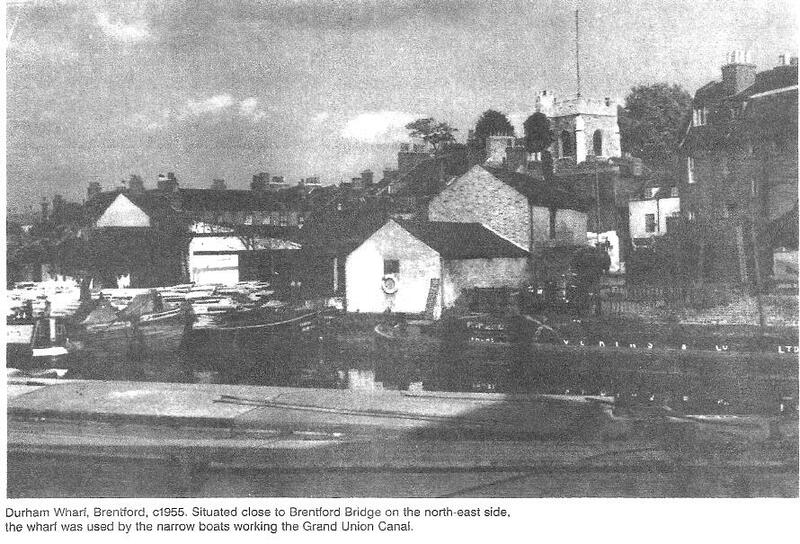 It is from an old calendar, the same image appears in Brentford Past. St Lawrence's Church is visible in the background and I think numbers 173 and 174 High Street is the hipped-roof building at the right edge of the photo. I have not found exactly the same view as it is today, but a 2008 photo is close. The barge to the right with lettering just visible was Vokins & Co's, a London lighterage company which had recently taken over a barge-builder's yard at Staffordshire Wharf on the south side of High Street(Brentford Past, p. 125).